My group was out at CREW on Saturday backpacking. We stayed at the gate 3 campsite Saturday night. On the way to camp we were hiking along the Pop Ash Slough Trail and we came across a fawn standing in the trail. As it saw us approach it went into “stealth” mode crouching to get as flat as possible to the ground. Of course this little fella was right in the middle of the trail but I’m sure it thought it was hiding. Fawns less than two weeks old usually crouch in place, rather than bolt away. It’s their way of “disappearing in place” because they are not quick enough yet to escape most predators. What a great sighting for this troop of scouts. Thanks to Jeff for sharing the story and the photo with us. 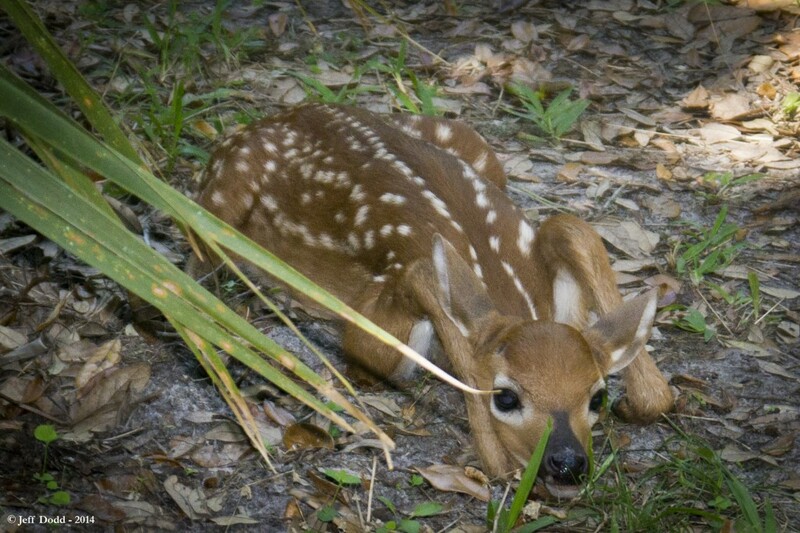 And thanks for respecting the fawn and leaving it alone and safe! If you have CREW wildlife sightings you’d like to share, please let us know so we can post them here for all to see.